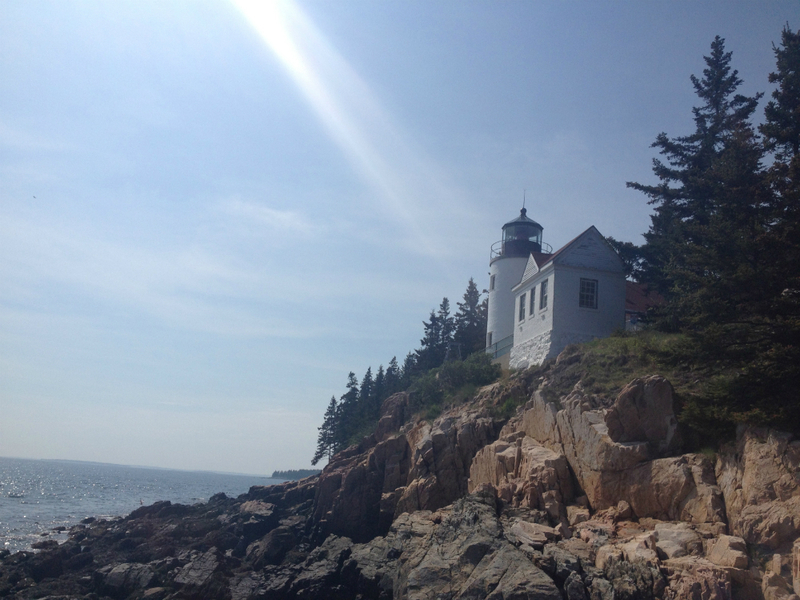 Andrew and I first vacationed in Maine in 2013 and fell in love with this beautiful island. We’ve been back every year since and feel like Mt. Desert Island is our home away from home now. We even got married there. 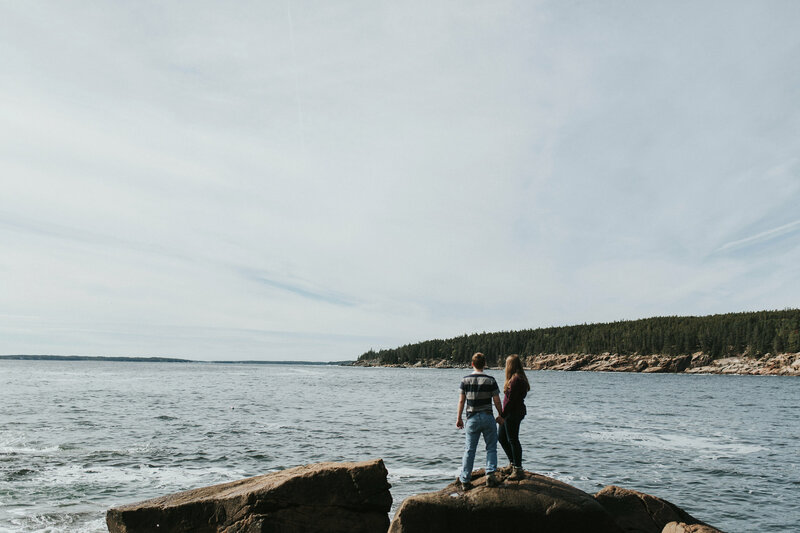 Here are a few of our recommendations for things to do (and for more ideas, check out Our Acadia). Andrew and I love the Asticou Inn—we got married there, after all. The inn overlooks Northeast Harbor and has an outdoor swimming pool and tennis court. It has forty-eight rooms, and each room is a bit different—some include sitting rooms or claw-foot bathtubs and both water and country views are available. There are many two-room suites with sofa beds that are great for families or groups of friends who want to split lodging costs. We love the upstairs suite in the Blue Spruce house and the downstairs suite in Bird Bank, as well as the rooms with balconies in the main inn. One downside to the Asticou is that it’s not walkable to anything. Expect a 20-minute drive to restaurants and other activities. Our top choice for those on a budget! You will get a great price and not feel like you skimped at all. The Atlantic Oceanside is an oceanfront hotel with an outdoor and indoor swimming pool and jacuzzi. 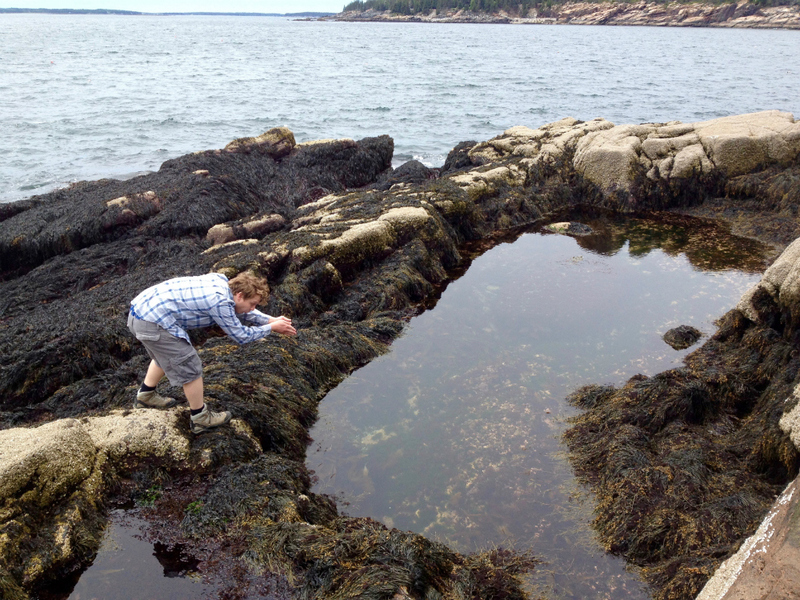 It’s located a 20-minute walk from Bar Harbor or a 5-minute drive. The rooms in the Atlantic View building are our favorite as each has its own little private patio or balcony overlooking the ocean. 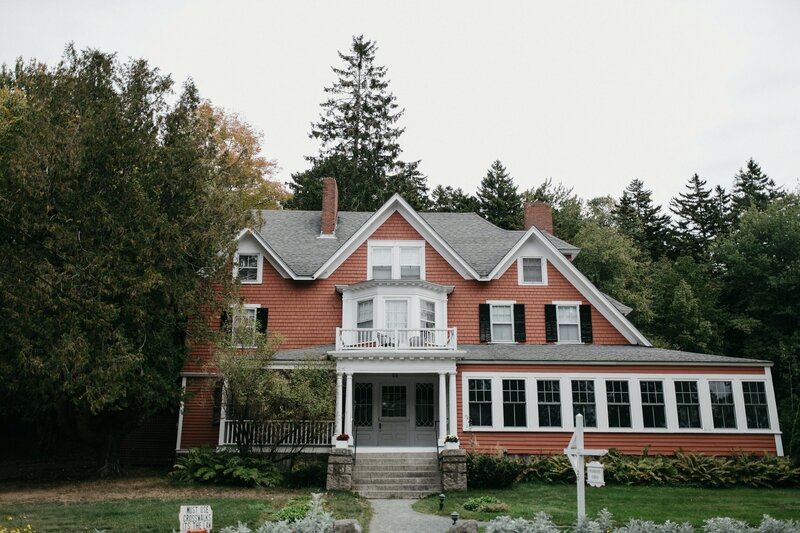 This classic B&B is located right in the center of Bar Harbor (with parking! ), which is a great benefit for evenings spent in town. The home is spacious and cozy and hosts Brian and Catherine are so warm and friendly. Our favorite feature was the outdoor patio—we ate breakfast out there every day and enjoyed a bottle of wine under the twinkle lights at night. 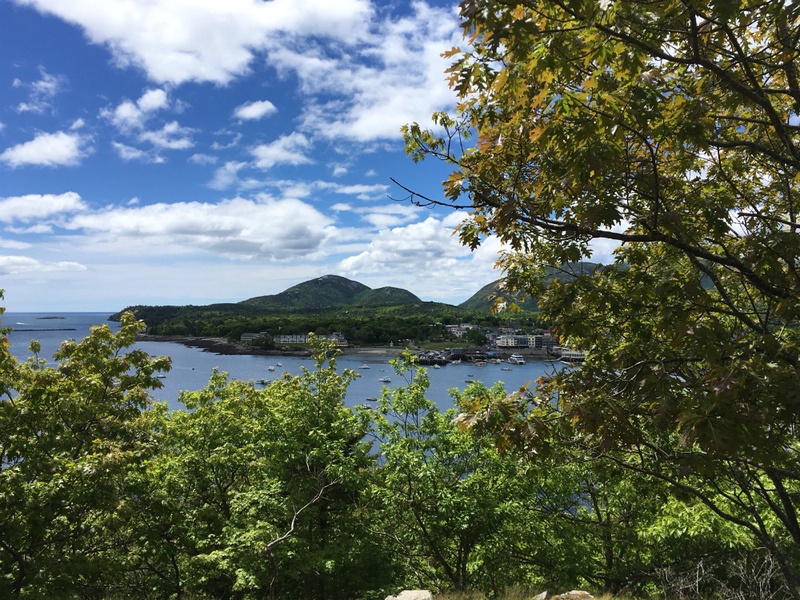 Even though we have been to Bar Harbor many times before, Brian still introduced us to a few new things, like a very helpful app with trail maps and info that can be accessed without cell service (Chimani Acadia, a must-download!). 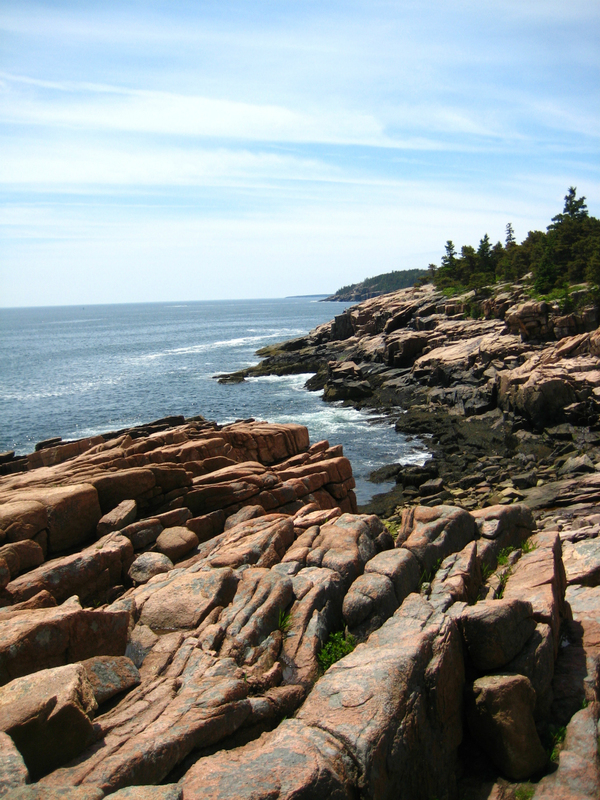 This beautiful national park is what first drew us to this part of Maine. Encompassing over 30,000 acres on Mt. Desert Island, the park has something to offer for everyone. Here’s my recommendation for a quick tour of the park’s highlights, which can be done in a couple hours and is accessible for all young and old. A drive around the Park Loop Road will let you visit many of the park’s most famous sites, including the Jordan Pond House, Cadillac Mountain and Thunder Hole. The loop was designed by Frederick Law Olmsted, Jr., the son of the man who designed Central Park. 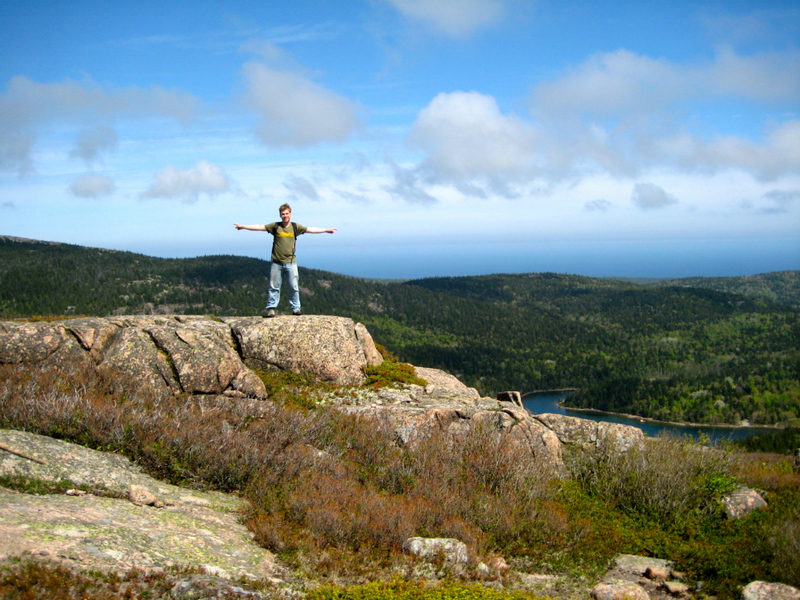 Start your tour at Jordan Pond, a beautiful lake surrounded by the Acadia mountains. Lots of day hikes start near Jordan Pond and there’s also an easy path around the lake perfect for any age (though it’s 3.5 miles long, you can easily do a small portion of it and still get the effect of the lake). Next stop: Cadillac Mountain, the highest peak on the Eastern seaboard and the first place that the sunrise is visible in the United States. 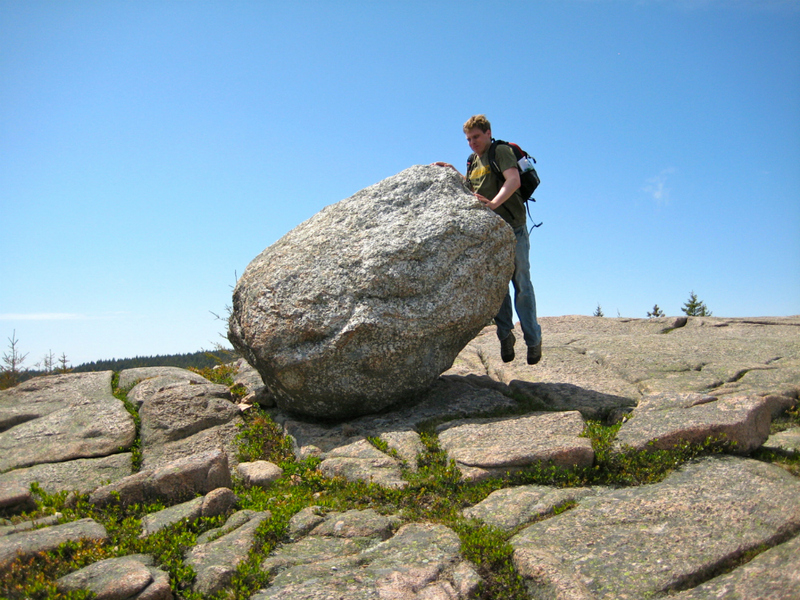 Cadillac Mountain is one of the few peaks accessible by car, so even non-hikers can enjoy the view. There’s a short half-mile loop around the summit that you can take to enjoy the panoramic views, or embark on the complete 3.5-mile ascent if you have a half day to spare. 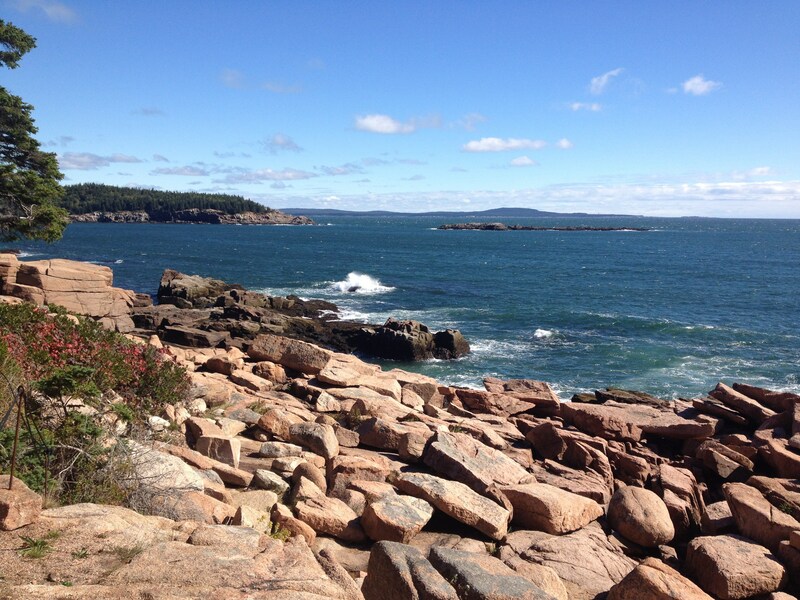 After your ascent to the top of Cadillac Mountain (by car or on foot), take the road toward Sand Beach to see Thunder Hole and the rocky coastline of Maine. At Thunder Hole, the waves crash against the shore, creating its namesake sound. The Ocean Path runs for 2 miles along the eastern shore of the park and the views are spectacular (the path is level and easy for all ages, but there’s plenty of opportunity to scramble on the cliffs for the more daring). 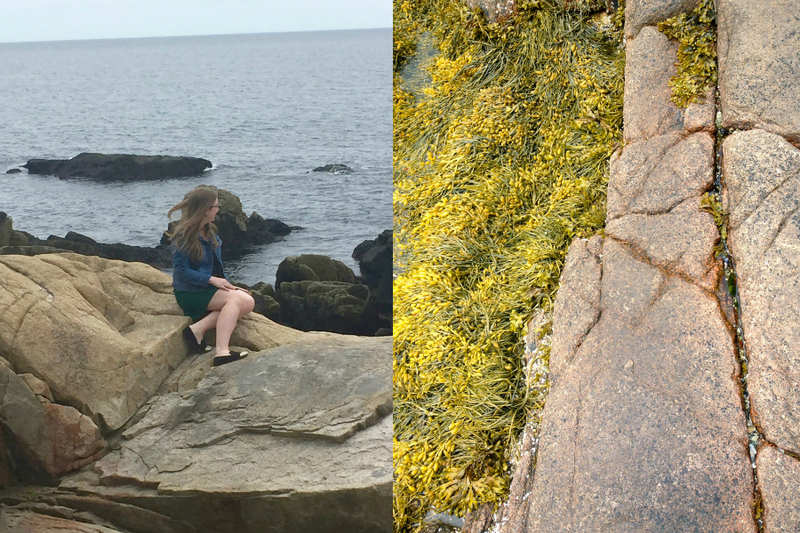 If you follow the Ocean Path around the southern bend of the island, you’ll come to Otter Point, one of my favorite spots on the island and a great place to explore the tide pools or just take in the gorgeous view of the ocean and the Cranberry Islands. 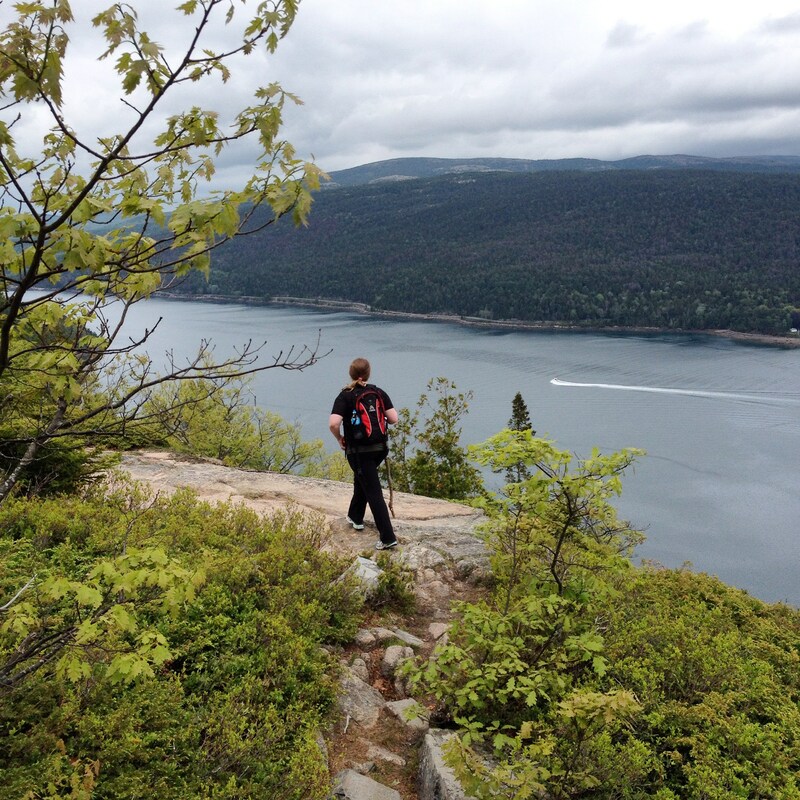 Some of my favorite intermediate hikes in Acadia have been Penobscot Mountain, Beech Mountain and Acadia Mountain. 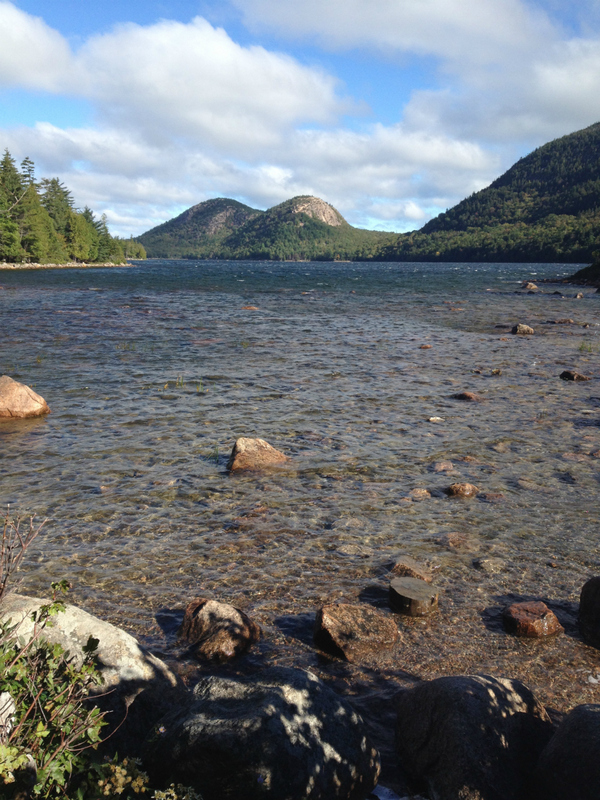 With 24 mountains to choose from, selecting a hike can be challenging, but the best website we have found for hiking information in Acadia is Joe’s Guide to Acadia National Park. For brave, experienced hikers, The Precipice and The Beehive are famous for their iron rungs and handrails for exposed scrambling. 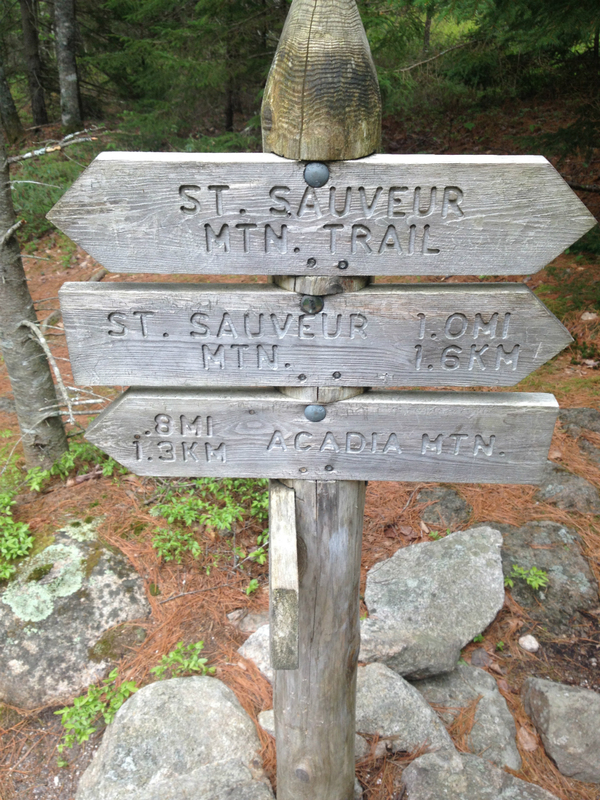 Beginners and kids can enjoy the Jordan Pond Loop and Ocean Path with ease. Any mountaintop you choose will afford amazing views of the mountains, lakes and sea and islands surrounding Mt. Desert Island. Canoe rentals are available at National Park Canoe & Kayak Rental on Long Pond. For reasons unknown, all bodies of water on the island are referred to as “ponds,” but this is definitely a misnomer—we paddled for four hours, surrounded by mountains and trees the vibrant green of spring and barely saw half of the lake. Look out for bald eagles! 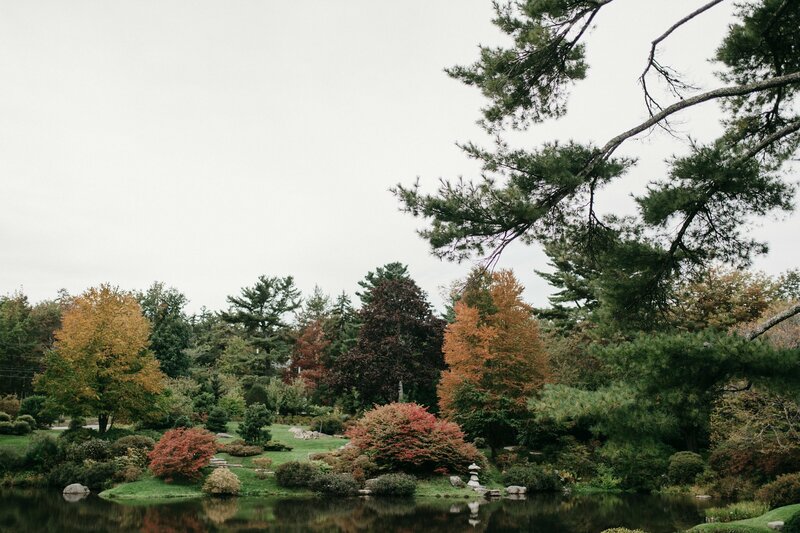 Located right across the street from the Asticou Inn, these beautiful gardens are definitely worth a stroll. Do you like mini golf? We do! 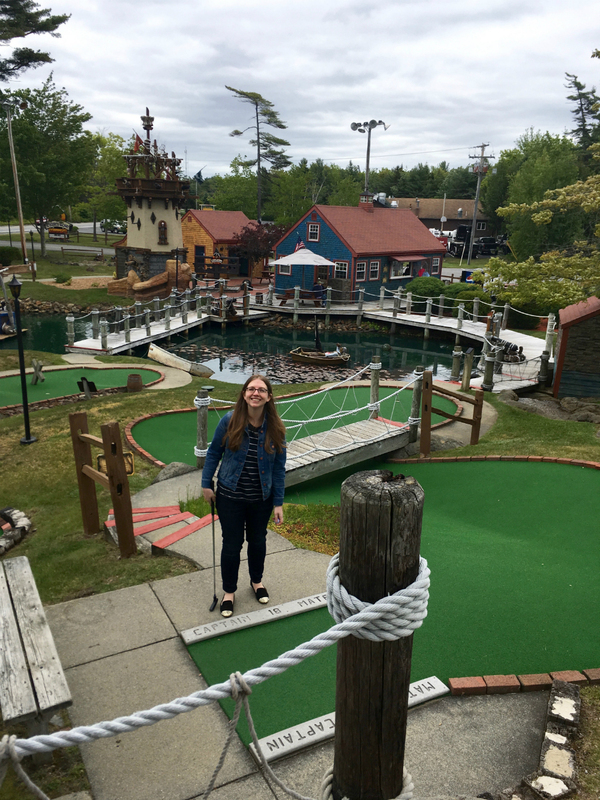 I think it’s probably because there really aren’t any mini golf course in New York City, so we are now mildly obsessed with them. This one is especially fun, with lots of caves and waterfalls—one hole is even on a pirate ship. Wildlife and whale watching cruises are available daily from Bar Harbor and Northeast Harbor. The Sea Princess has several daily nature cruise out of Northeast Harbor, while Acadia Nature Cruises and the Downeast Windjammer Cruise sail out of Bar Harbor. Kayak rentals and guided tours are available through National Park Sea Kayak Tours, Maine Sea Kayaking and Coastal Kayaking Tours. Here are some of our favorite spots on the island to grab a bite. 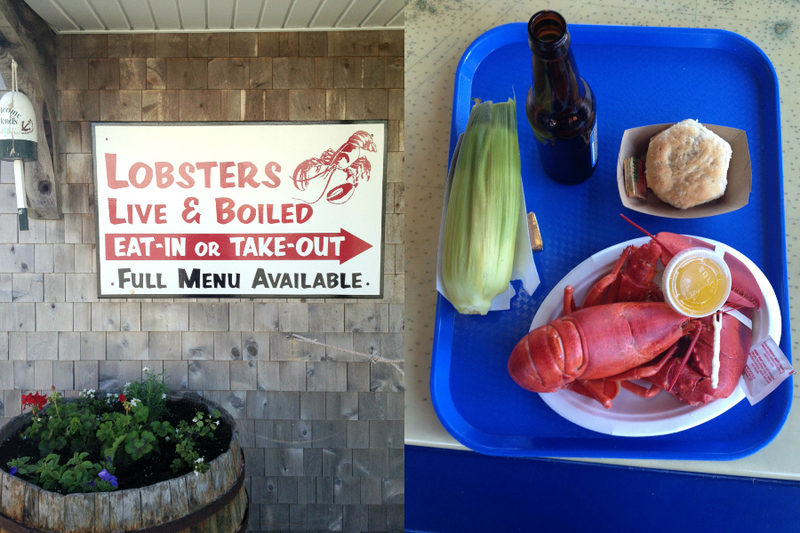 Hands down our favorite lobster pound (and we’ve sampled many). Beal’s is located in Southwest Harbor on a working lobster pier, so you can watch the lobster boats come in while you eat on the picnic tables or covered porch. If you’re looking for a classic lobster roll or whole lobster dinner (or lunch), this is our recommendation. Known for their pizza, ice cream and blueberry pie that’s absolutely bursting with fruit. Can’t imagine not having lobster at every single meal? No worries—order the lobster pizza! 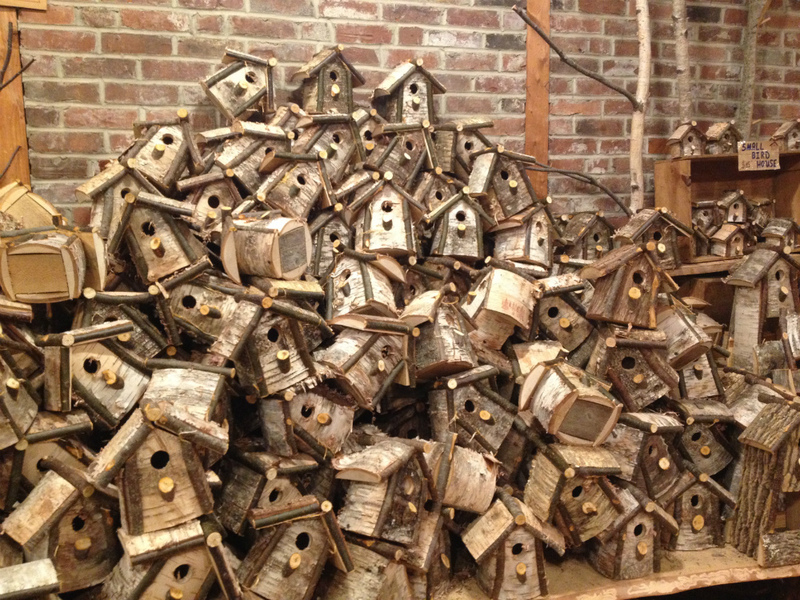 You can check out some of the cute artist shops in Southwest Harbor after your meal. One of our favorite places for dinner in Bar Harbor. The food is very fresh and the menu is creative, with lots of seasonal specials. Plus, they have a beautiful garden seating area. If the short rib nachos are on the menu that night, do not make the mistake Andrew did of eating the whole pickled habenero pepper. You will regret it. An all-around great casual dining restaurant with friendly staff and a nice bar. Try the lobster mac and cheese with one of their signature margaritas (daily happy hour from 3–6pm)! This Bar Harbor newcomer has a modern, eclectic vibe and serves a diverse menu of tapas and crepes with specialty cocktails. They have a great bar as well. You would like a cold beverage? No problem. Maine is a great beer-brewing state. Some of our favorite local brews come from the Atlantic Brewing Company, Sea Dog, Allagash and Shipyard. Maine is also famous for its blueberries, so don’t be surprised to see blueberry beers, blueberry margaritas and more. Great casual bar and grill in Bar Harbor. There’s a small back garden and the food is good as well. This casual bar also regularly books music acts. Plus, there’s an outdoor courtyard with bocce ball (and great pizzas too). Cool ambiance with unique cocktails. Here’s where to try that blueberry mojito or the bar’s signature cocktail, Dirty Water. We never fail to make a new friend when we visit this small pub. Delicious ice cream (including, yes, a lobster flavor) plus homemade fudge and nostalgic candies. This is our favorite store in downtown Bar Harbor for Maine-made goods, like blueberry jam, maple syrup and popover mix. We are not even sure if this shop has a name. You’ll find it down a side street off the main drag, but the antique selection is excellent. Look for the house with an Antiques and Jewelry sign on the side. For the ornament lovers out there, this is a must-stop. Hand-carved spoons, bowls, toys, birdhouses, chess sets, canoes, cutting boards—you name it, they have it. Plus, a giant rocking horse.